Overall it was a good day with some excellent speakers and interesting coffee break chat (surprising given that we were all clearly missing our usual Sunday lie-in!). My stream-of-consciousness notes are below, and you can also follow more from the live tweets from the day on #socialconf. First a shout out for this Guardian ebook, Connected, which looks very interesting. Never let it be said Guardian staff don’t know how to cross-sell. The excellent @guardianjoanna, Guardian social and communities editor and soon to be of Twitter, opened the day with fa fabulous keynote on the power of online communities, including the popular example of Caine’s Arcade. Geary emphasised the importance of talking to people in real terms – they are real people, not “conversions”. Macmillan Cancer Support are one charity that do this well and have a very engaged community. They are lucky in that they have a single clear aim: helping the 1 in 4 cancer patients have no family friends to support them. Another good example was the mobile provider Giff Gaff, built on the premise “what if you took away customer service from a mobile provider?”. They offer rewards (discounts) to their users for recommendations and helping fellow customers, as well as giving a significant portion to customers’ chosen charities – Geary said they give around £2 million each year to customers and charities like Water Aid. Find where people are already talking about what they want, said Geary. Moo.com, the namecard maker, have a vibrant Flickr community because they knwo their customers like to share their own designs of cards, which helps inspire other customers and espouses to the quality of their product. None of these communication strategies are mutually exclusive of course – you’ll prob have to think of all at the same time. More on the power of communities: Geary pointed to the political and economic power of Mumsnet, one of the few survivors of the dotcom bust. Politicians and businesses actively court this community – they’ve hosted a Q&A with Gordon Brown when he was running for re-election and a single post on a baby cream can clear Boots’ shelves of the product. Reddit is another example of a community with massive resonance offline. BUT you can’t know what they’re going to come up with. For every Caine’s Arcade (which earned several hundreds of thousands of dollars toward the kid’s college fund) there’s a witch-hunt like that which occurred on Reddit during the Boston bombings. Moreover, Reddit and other such know businesses and organisations will try to game their system. Subsections are dedicated to banning users seen to be doing such things. Geary then turned her attention to the Deloitte Taste of the Nation report on how social has an effect on economics. Generation Y are not tightening their purse-strings like other, older generations. If anything, they are increasing their spending. How are they making these decisions? The strong suggestion that social is very important – reviews, recommendations, crowdsourced from their friends, their acquaintances and the general online community. But just because they’re there in a community doesn’t always mean they’re buying stuff. Of course none of this new. Geary gave a shout out to the Cluetrain Manifesto, a set of 95 theses organized and put forward as a manifesto, or call to action, for all businesses operating within what is suggested to be a newly-connected marketplace. The emphasis is on two-way conversations between business and customers. Know why you’re doing it. The stronger and clearer your purpose, the easier you’ll find it to have conversations with your audience. Measure how its working in a meaningful way. And, said Geary, NEVER say it’ll run itself – it never will! This is a proper long term relationship and that takes a while and a lot of work. You need someone full time dedicated, skilled, effort. In the Q&A session, following the talk Geary was asked what made an online community (“people that are most passionate about [a subject]”). She mentioned how, at the Guardian most people hang around for a year before they comment. It’s a high bar to put yourself out there. She also pointed out how good web analytics are really key – the likes of Google Analytics and Chartbeat (really good for real-time measures) were mentioned. George Takei got a shout out as someone who manages his digital presence really well, as did Gary Vaynerchuk for his Wine Library (“focuses on the passion, not the sell”). When it comes to online communities around a product/service, you have 2 options, Geary said. Focus on the niche – what’s unique about you in a competitive space, or work and engage with those other communities – be useful to them. A good example is UniDan on Reddit. A biologist, he’s made a name for himself by just being really useful in answering questions on the site – to the extent that the community now call upon him for his expertise. “How important is a singular identity?” asked another audience member. “Don’t stop your advocates internal or external.” said Geary. Be brave. Do it and manage it in the right way and it’s powerful – people respond to faces. But have strong guidelines and make sure everyone is aware of them. Make your guidelines public. The Guardian have an internal site dedicated to tips and tricks to help their staff get the most out of the Guardian community. Finally, she also said that when it comes to “official” brand accounts you do need someone with oversight of all. The Guardian’s Community Manager stepped up next to talk about how the Guardian team is organised and what has and hasn’t worked for them. The Guardian have community managers/coordinators embedded in different editorial teams – from news, sport to finance – and a dedicated team of separate comment moderators. The Community Manager’s role is to represent the reader within the newsroom and ensure the community is not just an afterthought. 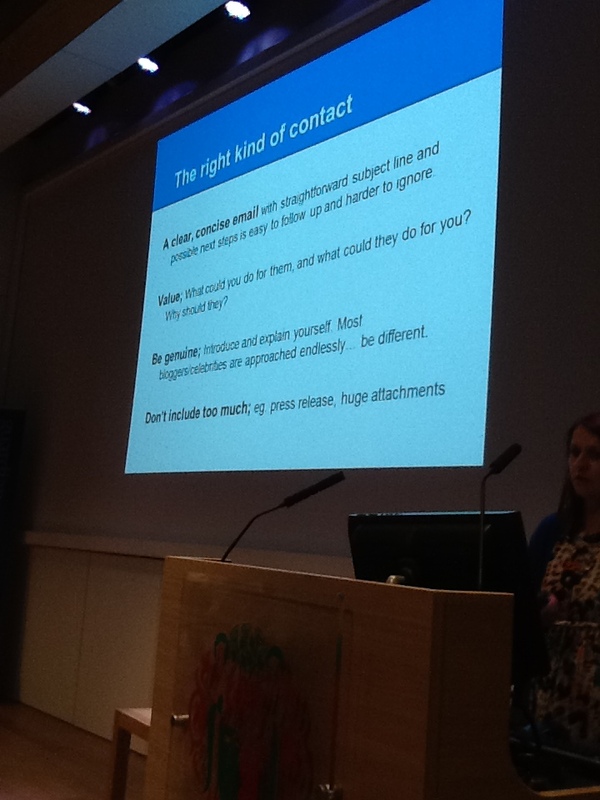 They look at the readers who naturally gather around their content but also reach out to those gaps they identify. Breaking news example: the Woolwich murder. When it comes to breaking news, an online community can be very useful to journalism. This is a case of finding people on the ground who are experiencing or will feel after effects. Bear in mind this is a transient community – it will dissipate very quickly. For this story, the Guardian set up a live blog, which allowed them to put out calls for input. They also used the Guardian Witness platform to gather photos, text and video submissions. They needed to establish contact with people as quickly as possible (think: what sort of contact info do you need from them upfront?). The important thing was to let people know you they were there so they know where to go and how to use contact them (as well as how to use any tools like Witness – have the app on their phone or the website bookmarked). Use all tools at your disposal – your own, social, email, text – whatever works. The Guardian put out a call for stories around unpaid internships in November 2011. This stemmed from a dry story about HMRC maybe looking into unpaid work. What the team noticed was a strong community reaction. They noticed people in the comments contributing stories voluntarily and enjoying reading others’. And it was these that formed the basis of a much longer investigation, which spawned other news stories. They key is to do a bit of content planning, as you’re not not likely to get many main stories out of this, at least at the start. Q&As, explainers, these types of content that fall between the big, main stories, can help to keep it ticking over and maintain interest in the community. This resulted in much more actual stories and exposes for the Guardian. Regularly engage with readers who are engaged at the beginning – respond to them, make spreadsheets and notes on who they were and how we get in touch with them. Keep updating that group regularly. Especially from the main journalist running the investigation. In this case, he used his own social profile, which allowed him to be easily identified as the the go to person at the Guardian on this subject. It’s not always braking news or investigations. Sometimes, community stories can be just discussion. The Guardian’s Culture section is a designated area for readers to discuss cultural phenomena. It helps the Guardian learn more about its readers and the site, what they think, like, don’t like. It means that when they do have a big event, they already have a goods sense of what the community thinks. the Culture section runs daily, weekly and monthly series where readers take over a part of the site and debate topics (e,g, top 10 songs, share your iPad art). A writer will then do a playlist/write up. It’s a fun tangential attachment to the main news agenda and broadens the expertise the Guardian editorial team can offer, who then use those insights to better commission. Essentially, it’s an ongoing user survey, but a fun one. Provide links to suggested things. Play the host and ensure there are some ground rules. The Guardian work hard to ensure there is a range of voices to challenge their readers, no more so than on Comment is Free. Challenge what you yourself might think. Every other day they have an Ideas thread – you tell us what you think we should get commissioned. Really simple. This is followed by a You Told Us thread that explains what they followed up on, what they didn’t and why. The question is how do we keep them contributing as this can get quite tired. For one thing, you’d better follow through, if not, explain why. Don’t overpromise especially specifics! Have a scale of reward for this type of community e.g. highlight particular comments in a thread with gold star. Or email them. Or mention them in a full article, or give them a comment of the week badge. Again, the Guardian Witness example. This was stuff from a community that already existed online. The Guardian wanted to use the site as a way to showcase alternative opinions. It was a way to build links with existing communities they may not have already been in touch with. The danger was that the platform might confuse readers. So the Guardian allowed them to sign up using their existing Guardian log-in. The platform itself was made very simple to use, either as an app or via the desktop site. They made it as natural as possible for people to use the range of tools on the app and thought a lot about how they favourite things, how they share with their friends – it’s got to feel natural. It needed a lot of work and marketing to launch and get going. Lots of planning. Needed extensive FAQs, user testing. One key utility: Who are the long lost users of the Guardian? They wanted to engage with these lurkers who never engage. Spent a lot of time and effort on emails and asking and giving feedback, rewards, light touch feedback. One tip: be careful what you ask for – don’t split and confuse readers by duplicating. Similarly, think about how you will reward effort. Sharing a photo is very different to asking users to make a 1 min video – reward what asks for a lot of effort accordingly. And note that your readers may be in diff time zones, and let them know what to expect – e.g. they may not get an instant reply. But if they get a holding message that tells them you are dealing with it (“we will read and curate, bear with us”) that helps. Another important to note regarding Witness – its goals for success are not just on user numbers but the relevancy of submissions. Don’t tolerate anything legally risky, taste and decency It’s hard to decide what is offensive, particularly for anything tribal like sport or politics, where the line between critique/banter and offense is blurred. The key thing for the Guardian is isit aimed at someone – is it personal? Air the discussion if you’ve taken a decision to deal with some suggestion that’s not appropriate or critical of the organisation. Channel any tangents to appropriate place so they are not detracting from editorial piece. The Guardian have also added to their site the ability to see how many people are participating in a conversation: is it 1000 comments between 1000 people or 3? As simple as threaded or nested comments, which you can now collapse. Also the ability to see just highlighted comments. These all help to encourage readers to participate (or at least read) below the line. They’re testing each of these features slowly bit by bit so they can see what the effect of each is rather than splurging all at once. Oliver also emphasised the need to hook in that person who’s just made that first step commenting – be welcoming, offer then a congrats and encouragement (if automated, so much the better!). Also seed out to places already having this debate, get them to come in. 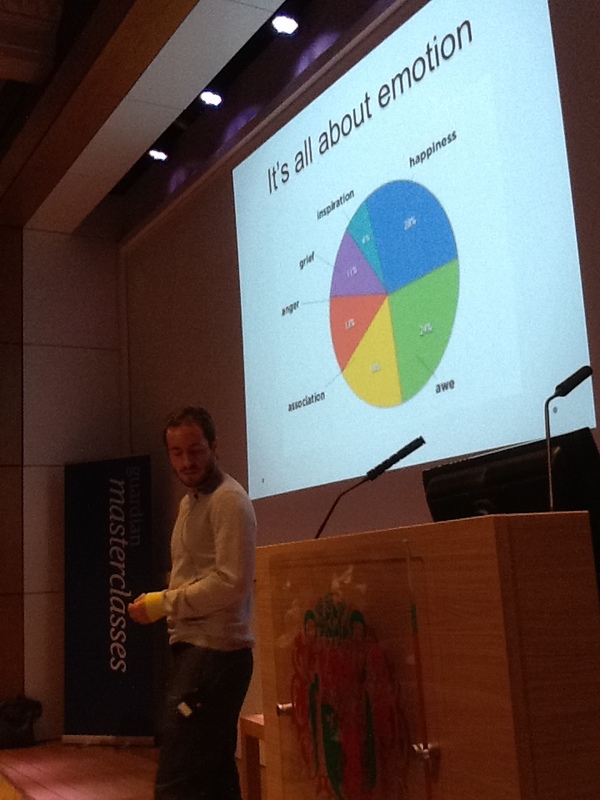 Buzzfeed UK’s Editor asked the simple but difficult question: what makes something go viral? The first question to think about is why make something shareable? Traffic of course is one big reason, but if people find it shareable that’s often because it’s interesting or useful to them. Second, (and echoing what earlier speakers had said), how do you know if something has been shared? Buzzfeed use Hootsuite and social flow among other tools. But you don’t need to have fancy software. At the end of every day just count up rts and shares, just treat it as a game. You don’t need loads of resources, tools or a attics, just make everyone motivated by it, give staff a cake for most shares. At Buzzfeed, as soon as you log on to the CMS, everyone can see each others’ stats, creating a competitive element that makes everyone do better. Also interesting is how Buzzfeed’s stats show the difference between seed views (clicks via the homepage) vs “social lift” (social shares) – and it’s the latter that they concentrate on. “Murder your darlings” read one of Lewis’s slides. If you had no galleries, no “hero spots” on your homepage, poor SEO and no help from “monster referrers” (like Reddit) – what would you do? Get creative with your content. Headlines, thumbnail photos, think about the emotion that the article triggers (THIS). “When you are free of SEO, that’s when you get creative,” said Lewis. When it comes to social, know your platform. Users of different social sites like different things. Inevitably, a lot of Buzzfeed’s traffic comes from Facebook, as the biggest social site in the world. But they actually want to break away from that and diversify, grow their referrals from others. So they put a lot of effort into making things work and appeal well on other platforms like Pinterest – DIY life hacks do well there, as do stories that appeal to their female-skewed audience , and of course a visual element that will pin well to pinboards (interesting fact: Buzzfeed’s CMS allows staff to search all the main photo agencies. Buzzfeed spend 7 figures on photo rights. They need to be certain photos can be shared and embedded by users as part of their quest for sharing). Go for the niche, said Lewis. Recognise that some things go viral only in 1 country (incidentally, Lewis got his job by pitching to the Buzzfeed US editors how localising their content to be more niche and spoecific to Brits could make a Buzzfeed UK work well). Virality is the opposite of what you were trained for as a journalist, he said. What you are after to make something shareable are not necessarily news values – it doesn’t even have to make it to the homepage. A couple of examples were lists of “20 signs you were raised by Irish parents” and “27 Things Only Developers Will Find Funny“. Make your site mobile friendly, as that’s increasingly how people are browsing and interacting with you. Think visually. Buzzfeed is lucky in that they have no display ads, so photos have room to breathe. Lewis also rails against the use of image galleries as a “horrible user experience” (Buzzfeed pastes the photos one after the other on a page for easy scrolling). Be original – almost always this is down to humour, but also timing – Buzzfeed puts out articles before something is even over (e.g. Miley Cyrus twerk gifs before the VMAs were even over). It’s all about emotion – Buzzfeed study into what make ppl share. And it’s almost always positive. Recognise that the motivations are different between clicks and shares. Buzzfeed UK recruited a Science Editor because they realised people want more ‘awe’ and science gives them that. What audiences want is some self-mockery but also identification – a sense of “you get me”. The Buzzfeed community, says Lewis, is “inherently upbeat” and they want to keep it that way, so that’s the tone they carry through all their services and presences. After all, that’s what people respond to. Left-right comparison pics seem to do really well for some reason. More gaming in the Buzzfeed CMS: writers get badges for when they reach get X hits or shares. Also sends alerts to tell you when something is close to going viral so you can rewtweet or reposition on homepage to help along. Buzzfeed US have a whole analysis team feeding back community comments and stats to writers – the UK staff mostly just rely on own on stats and their own searching for now. Odd number lists do well be maybe because people think every one must be brilliant (otherwise why 19?). Also seems less cliched if not top 10, 50 etc. They also don’t do definitive lists. Buzzfeed emphasise shareablilty – they considered putting business analysis stuff not on their homepage but on LinkedIn only, becausethat’s where the business community is. Image sources: sometimes from Tumblr or Flickr. Buzzfeed always credit back. Even if an image is all rights reserved they find that just asking a user often results in a yes. As implied above, they didn’t used to care much about their homepage, But they do a bit more now. Hence they put more news on it as now when readers get to it they want to know what’s going on in the world. Buzzfeed UK has mainly a young audience, but Buzzfeed US now much more in mainstream – more like the Huffington Post, so they’re trying to aim at everyone. Buzzfeed do keep a calendar of events so know things like the Royal baby are upcoming and they can plan ahead. But they definitely don’t have to be tied to news cycle. 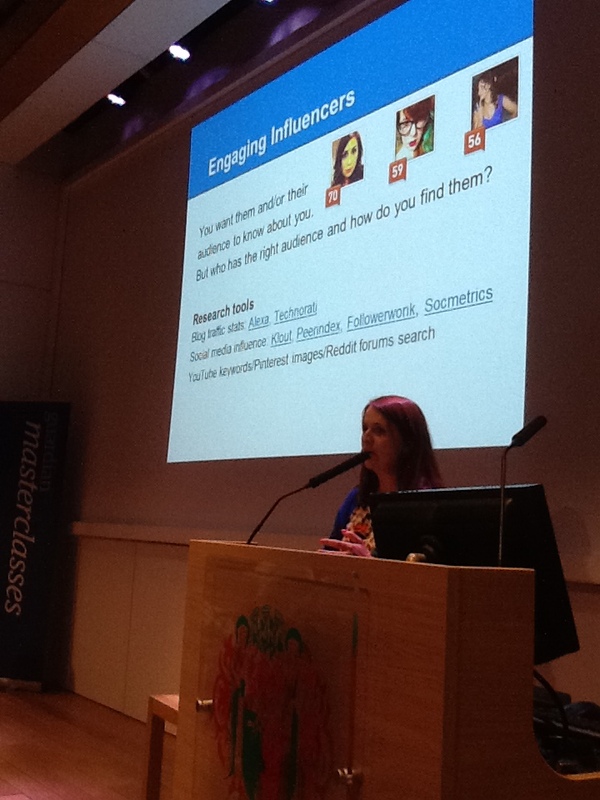 Google+ Local’s Sarah Drinkwater stepped up to talk about influencers and advocates. Her example started with her knowledge of food bloggers and attempts to engage them with reviews listed on Google Maps. Talk to people 1to1, she said. This gets tougher as you scale up, she acknowledged. But making that personal contact is key. Take your cues from your audience: dialogue has to be open, two-way, transparent. And Show your passion for your product! 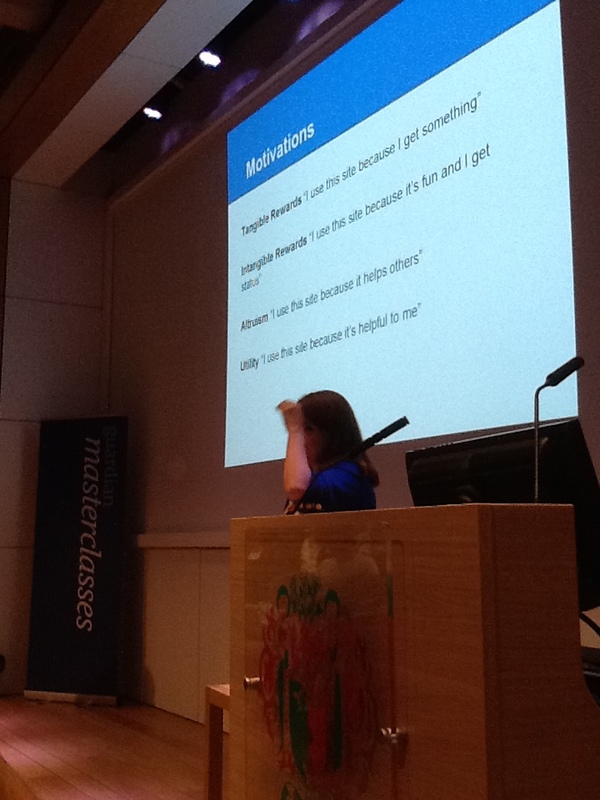 Recognise that you get your best positive feedback often from power users in your community. But don’t ignore traditional influencers too, particularly those not heavily engaged with social media. What’s the difference between power users and influencers? The former are already highly engaged with you, the latter are in the community but not as highly engaged (yet). The actual number of power users is always tiny. Of your users, 19.5% are likely to visit 2-5 times at most. Most people (80%) will visit one time only. What are some of their motivators? It’s all about recognition, especially when it comes to user-generated content. For most power users it’s intangible rewards + altruism. Badging/gamification, moderation, offline rewards, all can help engage a communnity if deployed apporpriately. Can be in product or informal – showcase status. Consider connecting offline as well as online – meet ups. Google did this with their Google city experts (G+ local). Once a month they have meet ups in a real place, provide goodies, newsletters and other stuff. This was launched quietly only on social but got picked up in the media (e.g. Techcrunch), which was an added bonus on top of rewarding their users. Consider influencer only events. Remember influencers know influencers, and generally like to meet other influencers. Build your guest list by introducing them to each other. 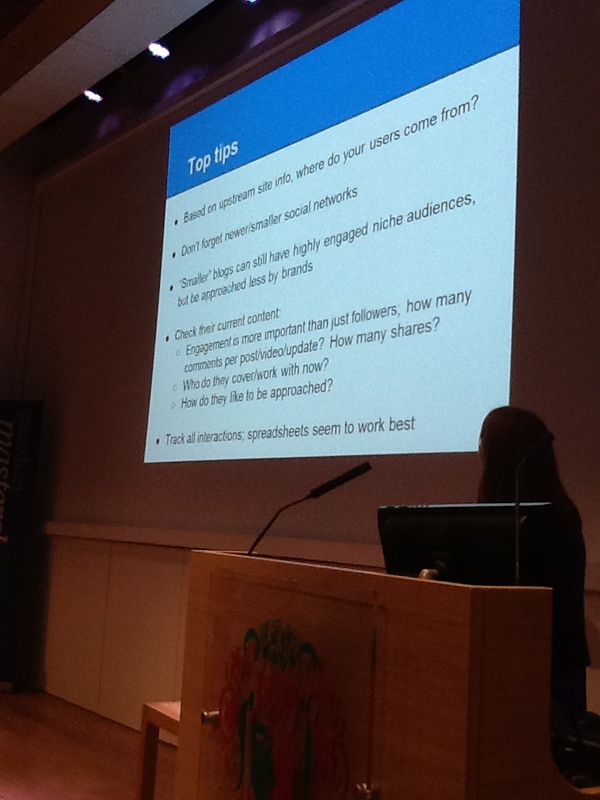 And make sure enough people from your team are there so your organisation can talk to everyone. How to find and work with influencers? Research is key. But be sure to use the right kind of contact. And remember, face to face builds relationships better than email. Really comprehensive notes here thanks for coming along!